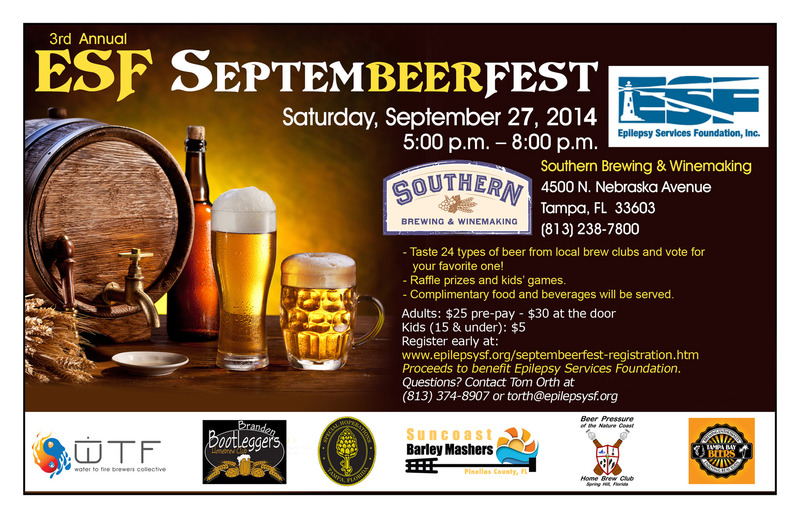 TAMPA, FL — Southern Brewing & Winemaking (Southern) is hosting the 3rd Annual ESF SeptemBEERfest in their biergarten on September 27th, 2014. This is the third year in a row that the festival has taken place at Southern. This beer festival, which features beers brewed by local homebrew organizations, is a fundraiser for the support programs at Epilepsy Services Foundation, Inc. (ESF) and all proceeds benefit the organization. Through past events, ESF has been able to raise $5,000 in its first two years, and 100 percent of the money raised was used to send kids with epilepsy to Camp Boggy Creek. At SeptemBEERfest, attendees will have the opportunity to sample 24 different homebrews from local clubs and vote for their favorite ones. The festivities will also include raffle prizes and kid’s games, and complimentary food and beverages will be served. Tickets are available online for $25 or at the door for $30. Children 15-years-old and younger are also welcome at the event for just $5. For more information about the event, please visit Southern’s Facebook event at http://bit.ly/ESFBeerfest or call 813-238-7800. To purchase tickets to the event, visit http://epilepsysf.org/septembeerfest-registration.htm. ESF is a private, non-profit organization that raises awareness and educates persons with epilepsy, families and caregivers, community organizations, businesses and school personnel about epilepsy and its impact on individuals with this medical condition. ESF works primarily with children with epilepsy and their families. The Epilepsy Services Foundation celebrates the persons with epilepsy whose seizures are controlled, works with persons whose seizures remain intractable, and honors those who have died due to seizures ESF provides a number of support programs for its children and families.